In a paper forthcoming in Philosophical Studies (also here), Rik Peels defends, against a variety of scientifically inspired objections, the traditional philosophical view that introspection is a reliable source of knowledge. He focuses especially on arguments I developed in my 2011 book Perplexities of Consciousness. Peels considers arguments for the unreliability of introspection based on: the sometimes large effect of reporting method (e.g., button press vs. verbal report) on the content of introspective judgments; cultural variation in whether dreams are seen as colored; the poor correlation between self-reported visual imagery and performance on cognitive tasks often thought to be facilitated by visual imagery (such as mental rotation or folding tasks); people's ignorance of their capacity for echolocation; and people's ignorance of the lack of detail and precision in the visual field. In each case, Peels presents the skeptic's argument in a couple of pages and then offers a couple of pages of objections. For example, Peels offers three responses to my observation that self-reports of mental imagery tend not to correlate with behavioral performance on seemingly related cognitive tasks. First, he points out that since people don't have access to other people's imagery, terms like "vivid" might be interpreted quite differently between subjects -- and thus people might be accurate in their own idiolect even if not in an outwardly measurable way. Second, he suggests that the aspects of mental imagery being reported (such as vividness) might not be relevant to the cognitive tasks at hand (like mental rotation), in which case lack of correlation is to be expected. Third, he notes that some studies (a minority) do report positive correlations. While in my discussion of this topic, I have given reasons to be leery of psychological findings that fail to replicate -- such as experimenter bias, "file-drawer" effects, the existence of confounding or intervening variables, and participants' tendency to confirm perceived research hypotheses -- Peels argues that I have presented insufficient positive evidence that such factors are at work in these cases. One's sense of plausibility, in such matters, comes close to being something like one's general academic worldview -- about philosophy, about psychology, and about their interaction. Here, I find the introduction and conclusion of Peels' essay interesting. (a.) Ordinary "common sense" tends to treat introspection as a reliable source of knowledge. To reject its reliability is to challenge common sense. (b.) There's a philosophical tradition from Descartes to Chalmers of taking introspection (appropriately restricted) as infallible. To reject introspection's reliability means abandoning the infallibilist tradition. (c.)There's a contrary "scientistic" tradition that emphasizes science as the only secure source of knowledge and regards introspection as non-scientific. To reject introspection's reliability plays into the hands of those who want to privilege the epistemic role of science. (d.) There's a debate within science about how to treat introspective self-reports. As these observations make clear, issues about introspection are inextricable from one's general sense of what philosophers and psychologists should be doing. I suspect that it is background differences between Peels and me on these sorts of questions that drive our different senses of plausibility in interpreting the empirical details. I want to resist the infallibilist tradition in philosophy, and the philosophical tradition that emphasizes "common sense", and other philosophical and metaphilosophical positions that seek to insulate philosophical reasoning from science. This is fundamental to my worldview and my vision of the nature of philosophy. My views on introspection are of a piece with this general worldview -- supporting that worldview, I think, but also supported by it. Other considerations that support such a worldview are (I argue) the incoherence and cultural variability of "common sense" and philosophical fashion, and evolutionary, cultural, and psychological reasons to think that people would likely be much worse reasoners about philosophical issues than they are about mundane, practical affairs. I would add to Peels' four considerations also a fifth consideration of a somewhat different sort: People usually want to be taken at their word when they say they're not angry, not racist, happy with their life choices. To express doubt is to deny people a certain sort of authority over the story of what is going on in their own minds. An introspection-friendly approach tends to cede people that sort of self-authority; an introspective-skeptical approach denies that self-authority. Again, there are big-picture worldview questions at stake, which both inform one's sense of how to interpret the psychological evidence and are in turn either supported or undercut by some of that same evidence. Although Peels' essay focuses on the empirical details of a few cases, this larger context both informs and motivates all work on the epistemology of introspection. Are we basically right about ourselves, and is philosophy of mind safe from radical scientific critique? Or is self-knowledge fragile and the armchair a tempting cozy spot to doze away into ignorance? Francois Kammerer has a forthcoming piece in Philosophia responding to my 2015 paper, "If Materialism Is True, the United States Is Phenomenally Conscious". I've drafted a reply to Kammerer. In Schwitzgebel (2015) I argued that the United States, considered as a concrete entity with people as some or all of its parts, meets all plausible materialistic criteria for consciousness. Kammerer (forthcoming) defends materialism against this seemingly unintuitive conclusion by means of an "anti-nesting principle" according to which group entities cannot be literally phenomenally conscious if they contain phenomenally conscious subparts (such as people) who stand in a certain type of functional relation to the group as a whole. I raise three concerns about Kammerer's view. First, it does not appear to exclude the literal phenomenal consciousness of actually existing groups of people, as one might hope such a principle would do. Second, Kammerer's principle appears to make the literal phenomenal consciousness of a group depend in an unintuitive way on the motivations of individuals within the group. Third, the principle appears to be ad hoc. Many thanks for reader comments on this earlier post, and especially to Francois Kammerer. Further thoughts, concerns, and comments welcome, either in the comments field below or by email to me. In 2014 Tina Fernandes Botts, Liam Kofi Bright, Myisha Cherry, Guntur Mallarangeng, and Quayshawn Spencer published the paper “What is the state of blacks in philosophy?” This paper produced a count of the number of “US BIPs”. This term was defined as follows: “a black person with a Ph.D. in philosophy from a U.S. philosophy program, a Ph.D. student in a U.S. philosophy program, or a non-retired employee of a U.S. philosophy program who is employed in an academic capacity (e.g., postdoc, adjunct professor, tenure track professor, etc. )” In that paper we concluded that as of May 2013 there were 141 US BIPs, and arguments were given (236) for taking this to be an accurate count. Note that this figure led the authors of What is the state of blacks in Philosophy? to estimate that 1.32 percent of the philosophy profession in the US are BIPs. 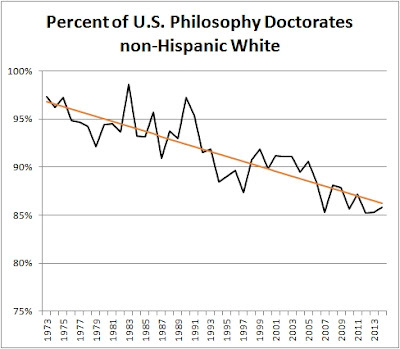 This coheres well with the finding in a previous post on this blog that “[t]he percentage of non-Hispanic Black or African American U.S. PhD recipients [has been] hovering around 1.4% to 2.2%” since the 1970s. A previous post on this blog examined the rate at which women were publishing in leading philosophy journals. In that work gender was coded by first name and familiarity; since it is even more difficult to code race by means of first name than it is for gender, extending this mode of analysis to the examination of racial publication patterns in philosophy would not be possible. However, as a consequence of the aforementioned work, the authors of What is the state of blacks in philosophy? have a database of US BIPs which there is some reason to trust. One of the authors of What is the state of blacks in philosophy? (also the author of this post), Liam Kofi Bright, has therefore produced a study of the publication patterns of US BIPs in leading philosophy journals. The publication records of 15 journals were used for this study: Philosophical Review, Journal of Philosophy, Nous, Mind, Philosophy and Phenomenological Review, Ethics, Philosophical Studies, Australasian Journal of Philosophy, Philosophers' Imprint, Analysis, Philosopher's Quarterly, Philosophy & Public Affairs, Philosophy of Science, British Journal for the Philosophy of Science, and Synthese. These journals were chosen since they were the top 15 of a journal survey ran on Leiter Reports in 2013. Noisy a signal though it may be, the results of this survey give some indication as to what were then perceived to be high prestige journals in philosophy. Publication records were sought for the years 2003-2012, that is to say the decade leading up to the point at which the US BIP database was compiled. For each person on the database of US BIPs I ran a search on Excel to see if their last name appeared in the author list of the journal in question. Even granting the approximate completeness of the 2012 US BIP database, three obvious weaknesses of this search method ought to be acknowledged. First, if a US BIP was active in the years up to 2012 but had dropped out of the labour force sometime before 2013, they would likely not appear in the US BIP database and so would be missed by this search method. Second, if authors have changed their last name (say, due to marriage or divorce) in the time between publishing during 2003-2012 and the compilation of the 2013 database, their old publications under their previous name would likely be missed by this search method. In one case where I was aware that this may be an issue special effort was made to search alternate names. However, I cannot rule out the possibility that this occurred in other cases I was not aware of. Third, it is possible that there are non US BIPs publishing in these journals during this time period – these people would not be apparent given this search method. To partially address the third problem, an attempt was made to estimate the proportion of US philosophers in the total population of authors. I did this taking a random sample of 200 authors from the total population of authors for all 15 journals in the time period under study. I google searched each of these authors to see if they either got their PhDs from a US philosophy department, or were employed by a US philosophy department during the period under study when their article was published. This brings the definition of US philosopher used here into line with the definition of US BIP. For the most part I was easily able to identify whether or not they met this definition of a US philosopher, and where I had difficulty (because there was no easy way of ascertaining their PhD granting school or employment history) I leaned towards not counting the person as a US philosopher. (I was uncertain in 23 of the 200 cases.) This method thus likely undercounts US philosophers. From applying this procedure I took 123/200, or 61.5%, as the proportion of US philosophers. Thus, if US BIPs are publishing in these journals at about the same rate as are US philosophers as a whole, they should have published approximately 1% of the total articles. There are not many publications by US BIPs journals during this period. In total there were 30 publications by US BIPs for all journals during this period. By contrast, there were 10659 publications overall during this period. This means that publications by US BIPs were 0.28% of the publications during this period. Of the 30 publications, 15 were research articles as opposed to book reviews. There were 7638 research articles overall in this period, meaning that research articles by US BIPs were 0.19% of the research articles published. Assuming that 61.5% of the population were US philosophers, this would make black philosophers 0.46% of the US philosopher authors. Likewise US BIPs would be 0.32% of US authors of research publications. In line with the findings of What is the State of Blacks in Philosophy? I found that the publications of US BIPs were clustered around certain topic matters. In the 2014 article we found that the top 5 most common AOS among US BIPs were (1) Africana, (2) Race, (3) Social and Political, (4) Ethics, and (5) Continental philosophy. I hand coded the topic matters of the 15 research articles on the basis of their titles and abstracts. Almost two thirds (9 of them) concerned at least one of: philosophy of race, political philosophy, or ethics. One journal, Ethics, accounts for almost half of the US BIP publications (13 of them). Note that in the 2014 article we coded people’s AOS by self-identification on their CV or webpage rather than looking at their publications, so this is not circular. None the less, any bias towards certain AOS’ that was involved in producing the initial database of US BIPs may have been reproduced in this count. Not many US BIPs published research articles in this period. The 15 journal articles were produced by 11 US black philosophers, 9 of whom were men and 2 of whom were women. For some perspective, Timothy Williamson published 15 research articles in the journals under study during this time period. Unless there has been a sea change in the years since 2012, US BIPs are not publishing much in journals which are considered high prestige in philosophy. Given the limitations of the method of analysis and the sort of data available, no firm conclusions about the causes of the low publication rate of US BIPs in these journals may presently be reached. The Survey of Earned Doctorates is a questionnaire distributed by the U.S. National Science Foundation to doctorate recipients at all accredited U.S. universities, which draws response rates over 90% in most years. The survey includes data on gender and ethnicity/race. Data for 2009-2014 are readily available online here. At my request, the NSF sent me gender and ethnicity/race data for philosophy going back to 1973. With the NSF's permission, here are the raw data. Philosophy response rates averaged 92% per year, and were over 85% in all years but two. Almost all respondents reported gender as male or female, with only 25/14495 respondents (0.2%) declining to self-classify gender. The total number of respondents increased from an average of 354/year in available data from the 1970s to an average of 484/year for available data in the 2010s. The chart below shows the percentage of women by year, along with both a linear regression line (green) and the best fitting quadratic curve (red). I tried a quadratic fit to test the hypothesis that the rate at which women are entering philosophy has flattened out in the 21st century, after an increase in the 20th (see for example, these data on publication rates in elite journals and this observation by Linda Alcoff). Another way to see the flattening is to aggregate by decade. In the 1970s, 17% of the SED philosophy respondents were women. In the 1980s it was 22%. In the 1990s it was 27%. In the 2000s it was also 27%. So far in the 2010s it has been 28%. 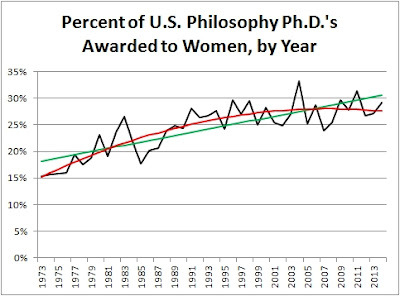 Conclusion: Since the 1990s, the percentage of women receiving Ph.D.'s in philosophy in the United States has been virtually unchanged at about 27-28%. For the analysis of ethnicity and race, I excluded the "ethics" data, which had too many suppressed cells, and I excluded respondents who did not report being a U.S. citizen or permanent resident, since race and ethnicity data were not available for those respondents. There were three ethnicity categories: "Hispanic or Latino", "Not Hispanic or Latino", and "Ethnicity not reported". Within "Not Hispanic or Latino", data were subdivided into "American Indian or Alaska Native", "Asian or Other Pacific Islander", "Black or African American", "White", "Two or more races", and "Race not reported". As expected, the large majority of respondents reporting both ethnicity and race were non-Hispanic White. Here are the numbers, with a linear regression. I also tried a quadratic curve, since I'd done it for the gender data, but it lay literally right on top of the linear regression line (with differences < .01%), so the simpler linear model is preferred. As is evident from the chart, although a large majority of respondents are still non-Hispanic White, the percentage has been decreasing since the 1970s, and (in contrast to the gender data) there is no apparent flattening of the trend. The numbers in all other categories are small, and are better seen in a decade-by-decade aggregation. These numbers include only U.S. citizens and permanent residents, but I have re-included respondents not reporting ethnicity or race. They are arranged from highest number to lowest. Most notable, of course, are the low percentages generally. Also notable is the increase from 1-2% Hispanic or Latino in the 1970s-1980s to 6.3% in the 2010s. This is still, however, well below the approximately 17% of the U.S. population that is Hispanic. It is also matched by a sharp decline in "Ethnicity not reported", raising the possibility that it is in part a reporting effect. 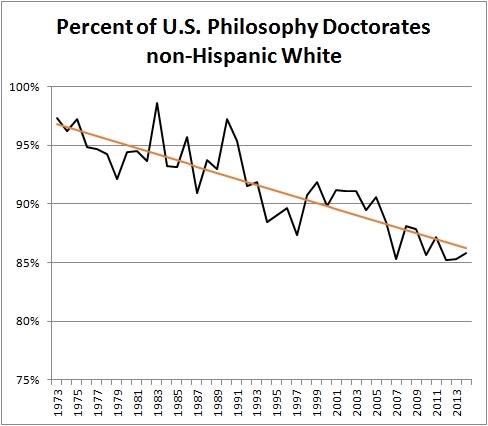 The percentage of non-Hispanic Black or African American U.S. PhD recipients does not appear to have increased much if at all since the 1970s, hovering around 1.4% to 2.2%, compared to 13% of the U.S. population. HT Carolyn Dicey Jennings for her input. We are collaborating on a paper together on some of these topics. Comments, corrections, and new analyses welcome. So What If Moral and Philosophical Reasoning Is Post-Hoc Rationalization? We think it's possible that a substantial portion of moral and philosophical reasoning -- including among professional philosophers (ourselves included) -- involves rationalization in this sense. The desire to defend a preferred conclusion -- a particular point one has recently made in print, for instance, or a favored philosophical thesis ("God exists," "Everything supervenes on the physical," etc.) -- might surreptitiously bias the employment and evaluation of plausibility, methodology, epistemic obligation, one's memories, one's starting points, one's feelings of confidence, and so forth, so thoroughly that that desire, rather than the reasons one explicitly offers, is the best underlying causal explanation of why one accepts the views one does. Suppose, hypothetically, that lots of moral and philosophical thinking is like that. (We won't defend that hypothetical here.) An interesting epistemic question is, so what? Would it be epistemically bad if moral and philosophical thinking were, to a substantial extent, highly biased post-hoc rationalization? (1.) On some topics -- including perhaps ethical and other philosophical topics -- our intuitive judgments may be more trustworthy than our reasoning processes. You know -- without having to work up some abstract argument for it -- that it's (normally) wrong to harvest organs from an unwilling donor; and if the first abstract argument you try to concoct in defense doesn't quite get you there, it makes perfect sense to hunt around for another argument rather than to decrease confidence in the moral conclusion, and it makes sense to give much more careful critical scrutiny to arguments in favor of forced organ donation. (3.) Even if rationalization is not epistemically beneficial, it might not be deleterious, at least in the context of professional philosophy. Who cares why a philosopher has the views she does? All that matters, one might think, is the quality of the arguments that are produced. Low-quality arguments will be quickly shot down, and high-quality arguments will survive even if their origins are not psychologically handsome. To use a famous scientific example: It doesn't matter if a vision of the structure of benzene came to you in a dream, as long as you can defend your view of that structure after the fact, in dialogue with your peers. While acknowledging these three points, we think that the epistemic costs of rationalization far outweigh the benefits. (A.) Rationalization leads to overconfidence. If one favors conclusion P and systematically pursues and evaluates evidence concerning P in a highly biased manner, it's likely (though not inevitable) that one will end up more confident in the truth of P than is epistemically warranted. One might well end up confidently believing P despite the weight of available evidence supporting the opposite of P. This can be especially dangerous when one is deciding whether to, say, convict the defendant, upbraid the student, do a morally questionable action. (B.) Rationalization impedes peer critique. There's a type of dialectical critique that is, we think, epistemically important in moral and philosophical reasoning -- we might call it "engaged" or "open" dialogue -- in which one aims to offer to an interlocutor, for the interlocutor's examination and criticism, one's real reasons for believing some conclusion. One says, "here's why I think P", with the aim of offering considerations in favor of P that simultaneously play two roles: (i.) they epistemically support P (at least prima facie); and (ii.) acceptance of them is actually causally effective in sustaining one's belief that P is the case. Exposing not only your conclusion but your reasons for favoring that conclusion offers your interlocutor two entry points for critique rather than just one: not only "is P true or well supported?" but also "is your belief that P well justified?" These can come apart, especially in the case where one's interlocutor might be neutral about P but rightly confident that one's basis for belief is insufficient. ("I don't know whether the stock market will rise tomorrow, but seeing some guy on TV say it will rise isn't good grounds for believing it will.") Rationalization disrupts this type of peer critique. One's real basis remains hidden; it's not really up for peer examination, not really exposed to the risk of refutation or repudiation. If one's putative basis is undermined one is likely simply to hunt around for a new putatively justifying reason. (C.) In an analogous way, rationalization undermines self-critique. An important type of self-critique resembles peer critique. One steps back to explicitly consider one's putative real reasons for believing P, with the idea that reflection might reveal them to be less compelling that one had initially thought. As in the peer case, if one is rationalizing, the putative reasons don't really explain why one believes, and one's belief is likely to survive any potential undercutting of those putative reasons. The real psychological explanation of why you believe remains hidden, unexamined, not exposed to self-evaluation. (D.) As a bit of a counterweight to point (2) above, concerning community benefits: At the community level, there's much to be said in favor of a non-rationalizing approach to dialogue, in which one aims to frankly and honestly expose one's real reasons. If you and I are peers, the fact that something moves me is prima facie evidence that it should move you too. In telling you what really moves me to favor P, I am inviting you into my epistemic perspective. You might learn something by charitably considering my point of view. Rationalization disrupts this cooperative enterprise. If I offer you rationalizations instead of revealing the genuine psychological grounds of my belief, I render false the first premise in your inference from "my interlocutor believes P because of reason R, so I should seriously consider whether I too ought to believe P for reason R". The force of consideration (1) in favor of rationalization depends on recognizing that intuition can be more trustworthy than argument in some moral and philosophical domains. It's possible to recognize this fact without endorsing rationalization. One approach is to frankly admit that one believes on intuitive grounds. A non-rationalizing argument for the conclusion in question can then be something like: (i.) I find conclusion X intuitively attractive, and (ii.) it's reasonable for me to accept my intuitive judgments in this domain. That argument can then be exposed to interpersonal critique and self-critique. It’s also unclear how much comfort is really justified by consideration (3), concerning quality detection. In moral and philosophical reasoning, quality can be difficult to assess. We are not confident that a philosophical community full of rationalizers is likely to reject only low-quality arguments, especially if patterns of motivated reasoning don't scatter randomly through the community, but tend to favor certain conclusions over others for reasons other than epistemic merit. For these reasons we think we ought to be disappointed and concerned if it turns out that our moral and philosophical reasoning is to a large extent merely post-hoc rationalization. Three notable things this past year were (a.) more commitment to writing in popular venues, including three pieces in the Los Angeles Times, (b.) a couple of journal articles on skepticism, bringing together some of my work on the psychology of philosophy with my long-standing (but mostly unpublished) interest in skeptical epistemology, and (c.) work connecting my interest in science fiction with issues in philosophical methodology and the ethics of technology. I am also continuing to work on some of my other favorite topics: self-knowledge, moral psychology, the nature of attitudes, classical Chinese philosophy, and the moral behavior of ethicists. “Philosophers' biased judgments persist despite training, expertise, and reflection” (first author, with Fiery Cushman), Cognition 141, 127-137. “Cheeseburger ethics” Aeon Magazine, featured article Jul. 14. “Experimental evidence for the existence of an external world” (first author, with Alan T. Moore), Journal of the American Philosophical Association 1, 564-582. “If materialism is true, the United States is probably conscious”, Philosophical Studies 172, 1697-1721. “A defense of the rights of Artificial Intelligences” (first author, with Mara Garza), Midwest Studies in Philosophy 35, 98-119. “Death and self in the incomprehensible Zhuangzi” (trans. into Chinese by R. Wang), Journal of Shangqiu Normal University. (revised and updated) “Belief”, Stanford Encyclopedia of Philosophy. “Philosophy via Facebook? Why Not?” Los Angeles Times op-ed Jul. 19 (Wiley-Blackwell). “What's missing in college philosophy classes? Chinese philosophers” Los Angeles Times op-ed Sep. 11. “You are ignorant of yourself” Slate, Templeton Big Ideas: What do we know? “We have greater moral obligations to robots than to humans” Aeon Opinion, Nov. 12. (forthcoming) Preface to Marco Caracciolo and Russell T. Hurlburt, A passion for specificity, Ohio University Press. special issue of Midwest Studies in Philosophy, on science fiction and philosophy. Philosophical speculative fiction: Recommendations from 41 philosophers, with a brief introduction on the philosophical value of science fiction. “Philosophers recommend science fiction films” (an abbreviated version of the speculative fiction list, focusing on film) The Philosophers Magazine 71, 101-106. (forthcoming) “Philosophers recommend science fiction” (another abbreviated version of the list), in S. Schneider (ed.) Science Fiction and Philosophy, 2nd ed. Wiley-Blackwell. “The intrinsic value of self-knowledge (comments on Q. Cassam)”. “Against intellectualism about belief (comments on J. Marley-Payne”. “Out of the Jar”, The Magazine of Fantasy and Science Fiction 128, 118-128. “The Tyrant's Headache”, Sci Phi Journal 3, 78-83. “Momentary Sage”, The Dark 8, 38-43. “The Dauphin's metaphysics”, Unlikely Story 12 [Locus recommended by Lois Tilton]. (reprint) “Reinstalling Eden”, (first author, with R. Scott Bakker), StarShipSofa 392. (reprint forthcoming) “Reinstalling Eden” (first author, with R. Scott Bakker), in S. Schneider (ed.) Science Fiction and Philosophy, 2nd ed. Wiley-Blackwell. at Closer to Truth on consciousness. at Unlikely Story on my story "The Dauphin's Metaphysics". at People for the Ethical Treatment of Reinforcement Learners (with Mara Garza) on robot rights. at Kingdoms of Evil on speculative fiction, philosophy, and my story "Momentary Sage". at Philosophical Percolations on philosophy and science fiction. at The Magazine of Fantasy & Science Fiction on my story "Out of the Jar". at Very Bad Wizards on moral psychology. at Rationally Speaking on the moral behavior of ethicists. Here's hoping for a similarly fun and productive 2016!